Exactly how much oil was released into the Gulf of Mexico during the BP disaster? Billions of dollars of Clean Water Act penalties are at stake—and a large portion of the money available for restoration. Perhaps it comes as no surprise that BP is claiming the amount of oil spilled is far less than we’ve all heard. Two days after the April 20 blowout, an internal BP memo warned the well could be sending 80,952 barrels (3.4 million gallons) of crude oil into the Gulf of Mexico every day. 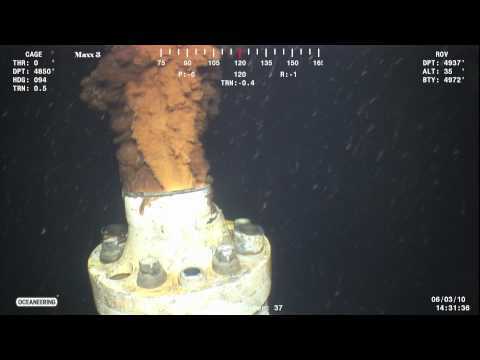 Four days after the blowout, BP publicly stated the spill was 1,000 barrels of oil per day. Eight days after the blowout, over protests from BP, the Coast Guard increased its estimate to 5,000 barrels a day. The estimate was based on limited information as the Coast Guard did not have access to video of the spill. On May 10, BP held a telephone press conference where Senior Vice President Kent Wells asserted “There’s just no way to measure” the flow rate from the well. Two days later, under pressure from Congress, BP released a short video clip, material they’d available since soon after the blowout. On August 2, a team of scientists appointed by the government released their consensus estimate that 62,000 barrels a day initially gushed from the well, later dropping to 53,000 barrels a day as the well began to deplete. This remains the government’s official estimate. In June, the Houston Chronicle reported that BP is planning to argue in court that the government is overestimating the amount of oil that spewed into the Gulf by 50 percent. This lower estimate would cut the maximum Clean Water Act penalties by $7 billion. Keep BP’s history in mind as you follow coverage of the trial. Whatever the court rules about the size of the spill, the disaster’s impacts are ongoing. Read our latest posts on dolphins and blue crabs. Tell the Department of Justice to do everything it can to ensure that BP is held fully accountable for its recklessness!